Vehicles were caught in a river of mud from a flash flood in Acton on Thursday, Aug. 3, 2017. 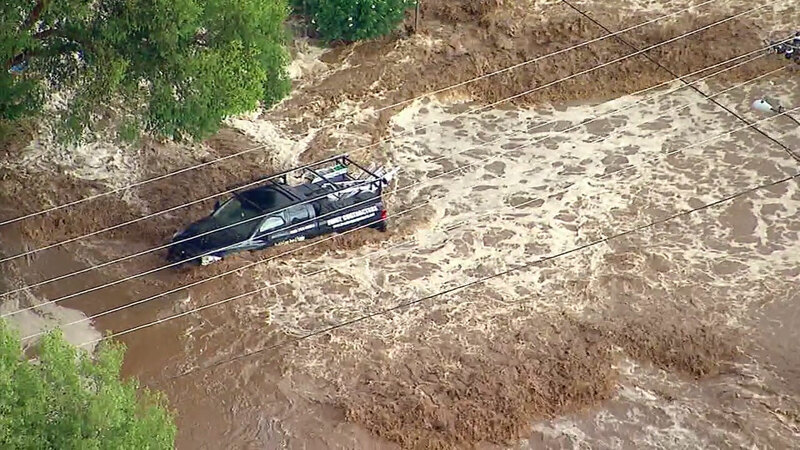 ACTON, Calif. -- A sudden downpour triggered a flash flood that washed out roads in Acton, trapped cars in a river of mud and overflowed onto the southbound 14 Freeway Thursday afternoon. The rushing water washed out the intersection at Red Rover Mine Road and Sierra Highway, and then overflowed onto the 14. Cars continued trying to cross over the growing stream and avoid being washed away. A pickup truck was seen stuck in the rushing waters as rescue crews worked out a plan to save the driver. Other cars were seen getting stuck in water at least 2-3 feet deep. The backyards of some homes and fences were also overwhelmed by water. A sudden downpour washed out a road in Acton, leaving cars trying to navigate a river of mud Thursday afternoon.